Any other vehicles not here please call us. We have them all. Tutorial: If you didn't have a CV before this drive shaft you will need a CV style 1310 END YOKE which is FOUND HERE. If you can't find it call us. Front or rear drive shaft with no CV one u-joint on each end with a slip in the middle. See how to measure . Measure u-joint end cap to end cap and the diameter of the bearing cap. 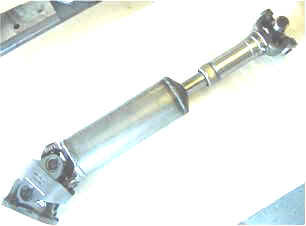 Stock drive shaft with transmission slip yoke on two wheel drive and 4x4. Drive Shaft with no CV one u-joint on each end with 31 or 32 spline slip yoke. The difference we will know by the year/model you will provide/ See how to measure. We have drive drive shaft for all explorers and Ford Rangers early and late model for all years. Prices are comparable to the one above when CVs are not involved. For example $275 for a two piece Ford ranger complete and precision balanced. All our parts are new Look at you drive shaft and then pease call us.. There a several variations of the two piece that you will have to let us know by the comment section of the checkout form or call us and we will figure it out on the phone. 1410 U-joints with a 3.5 inch heavy duty tube precision balanced. All new parts. THIS REPLACES THE OLD ONE FOR BRONCO II 1986-1990. IT IS MADE OF UJOINTS. NEXT TIME JUST REPLACE U-JOINTS. We have ready-made tubes. Measure Center to Center of u-joint on you tube or from the seal of the transmission to the center of the u-joint at the pinion and let us know. We will make you one that size with aluminum or convert it to steel for $200 with u-joints and precision balanced. We do need to know, if you have a flange on the rear and the type of yoke you have. Some Fords and Dodges have flanges on the rear pinion.